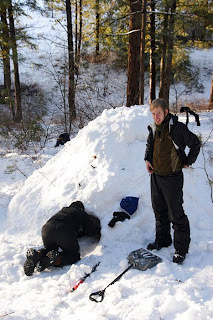 The winter trip was an exciting week that ended the first semester of the 2009-2010 Wilderness Certification Program. We stayed in a beautiful location near the Methow Valley of North central Washington. 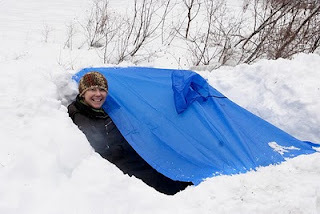 The week began with students making a variety of snow shelters to sleep in for the week. 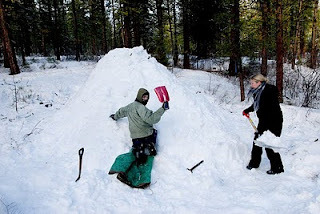 Greg G. and Tim D. are working on a quinzee snow shelter in the top photo. The second photo shows another quinzee being worked on by Kelley G. and Matt E.
Here is Kelley demonstrating a different kind of shelter. 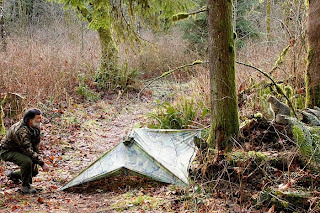 This is an emergency shelter than can be made in 30 minutes or less, called a "down and out" shelter. 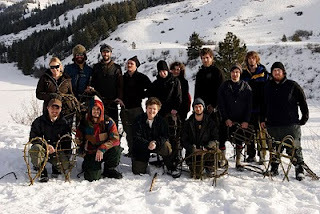 On this trip, students also made primitive snowshoes out of willow boughs. Here AWCP student Jason M. teases the frame gently into the proper shape. It takes patience and a steady hand, but thankfully willow is more forgiving than other types of wood. Overall an amazing week in a beautiful place. Some of us even had an opportunity to hear wolves howling and great horned owls serenading in the evenings. We look forward to another trip to the North Cascade Mountains with next year's class! 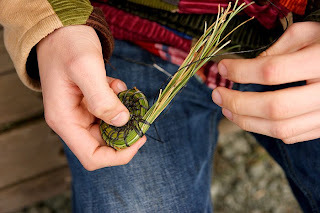 Students spent a day with Karen Sherwood working on making pine needle baskets by hand. 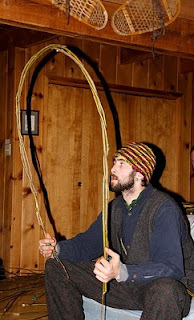 Here is Nick Laptew working on his basket above. 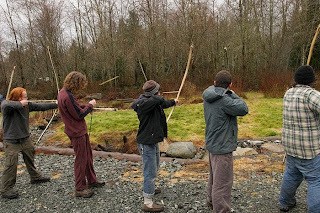 On another day we worked with Frank Sherwood on making and using primitive longbows. Look at the arrows fly out of the bows of AWCP students (from left to right) Alex, Keith, Tim, Shea, and Justin! 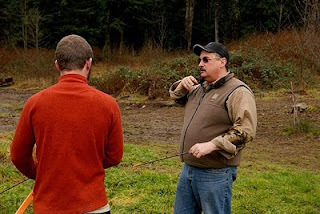 Here Frank instructs AWCP student David on proper technique for how to draw the bow and focus the attention. Later, students spent another fun day learning from instructor Allan "Hawkeye" Sande about emergency shelters. In this case, one made from a poncho. The day included many other shelters as well as more opportunities to practice teaching/mentoring skills with the experienced coaching of Allan.